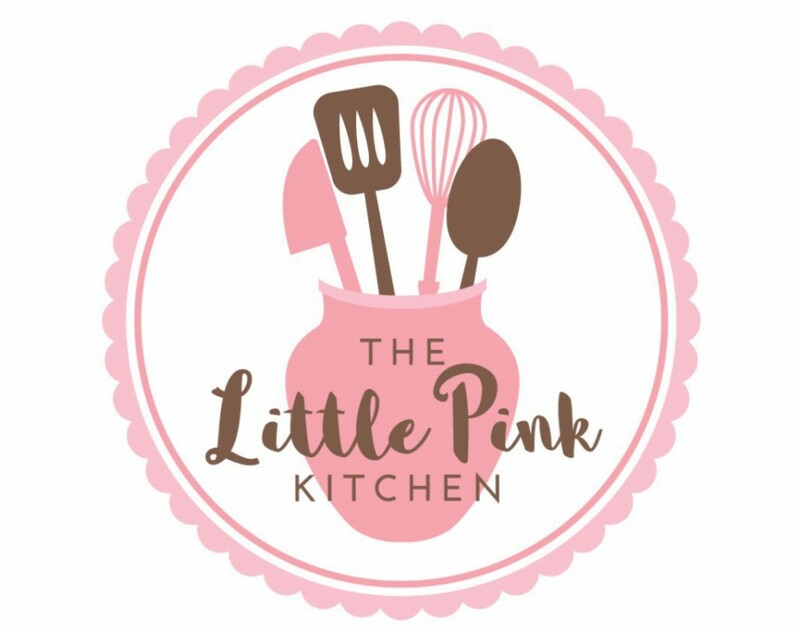 People who follow ‘The Little Pink Kitchen’ on social media are aware that in the last year I’ve lost a lot of weight at Slimming World – over 5 stone. As a result, I’ve recently changed the focus of my blog from baking (which I love but it isn’t good for my waistline) to healthy eating – although this doesn’t mean that I’ll never eat cake again! When I say ‘healthy eating’, I don’t mean anything faddy just fresh food that is prepared from scratch in a healthy way (low fat / low sugar etc) but without compromising on flavour. 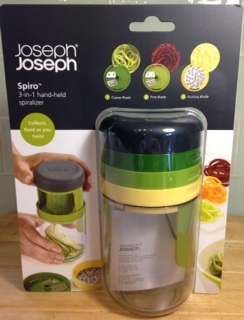 It was therefore very timely that I was contacted by JosephJoseph who asked if I’d like to try their new 3 in 1 hand-held spiraliser – called Spiro – and write a review. As I’m already a fan of the brand, I had no hesitation in saying yes and yesterday I spent some time playing around with the spiraliser and a selection of vegetables. Oh, and some cheese was involved too. Out of the packaging, there are 5 components which include 3 different blades: a coarse and a fine spiralising blade and a grating blade. 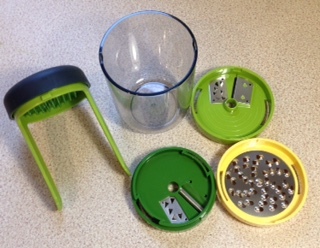 The soft grip lid is easy to turn and it has 2 guide arms that keep the food straight when you twist it. 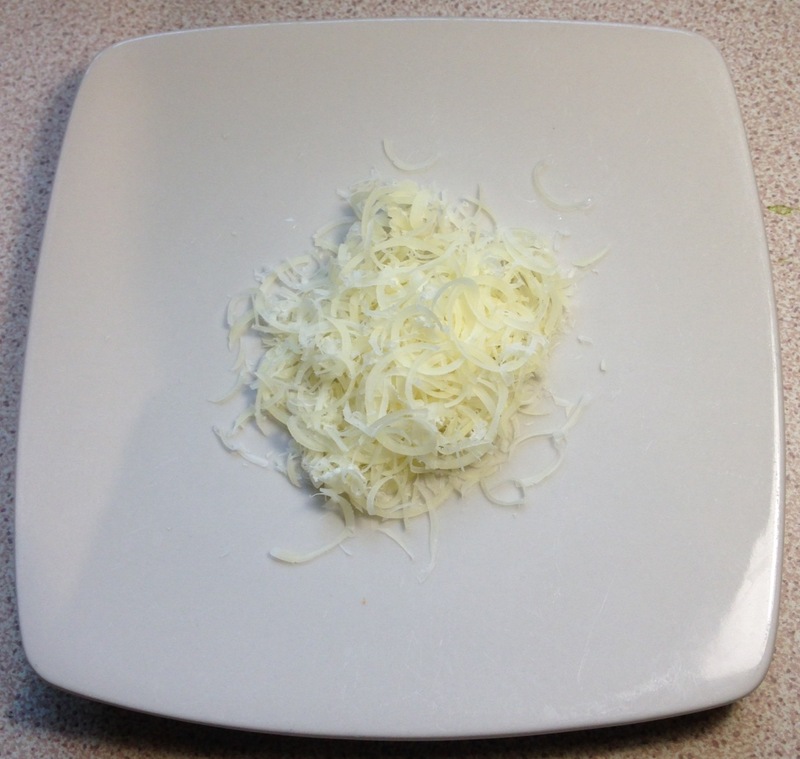 The spiralised or grated food is then collected in the clear container which means you don’t get bits of vegetables over the worktop. What’s really handy is how compact the gadget is: when not in use the three blades stack on top of each other and the whole thing takes up hardly any space in a cupboard or a drawer. 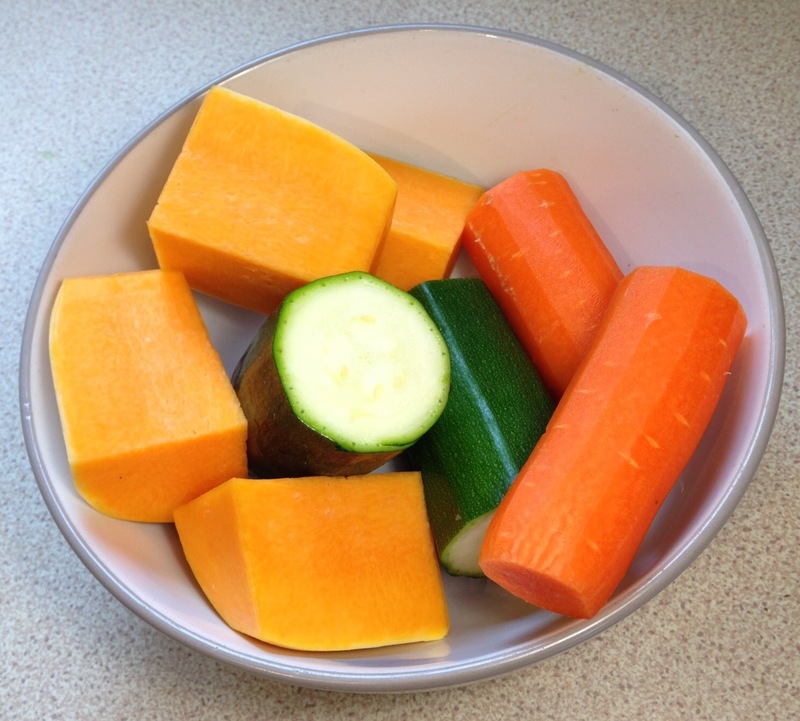 I selected vegetables with different textures (courgette, peeled carrot and peeled butternut squash), washed them and trimmed them into straight pieces. JosephJoseph recommends that for the best results, the vegetables should measure roughly 3 inches x 1 ½ inches (8 x 4 cms). Select blade type – take care as they are sharp! 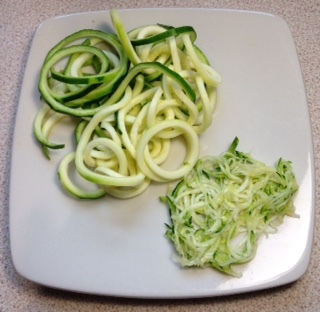 I started with the courgette and used the fine spiralising blade. 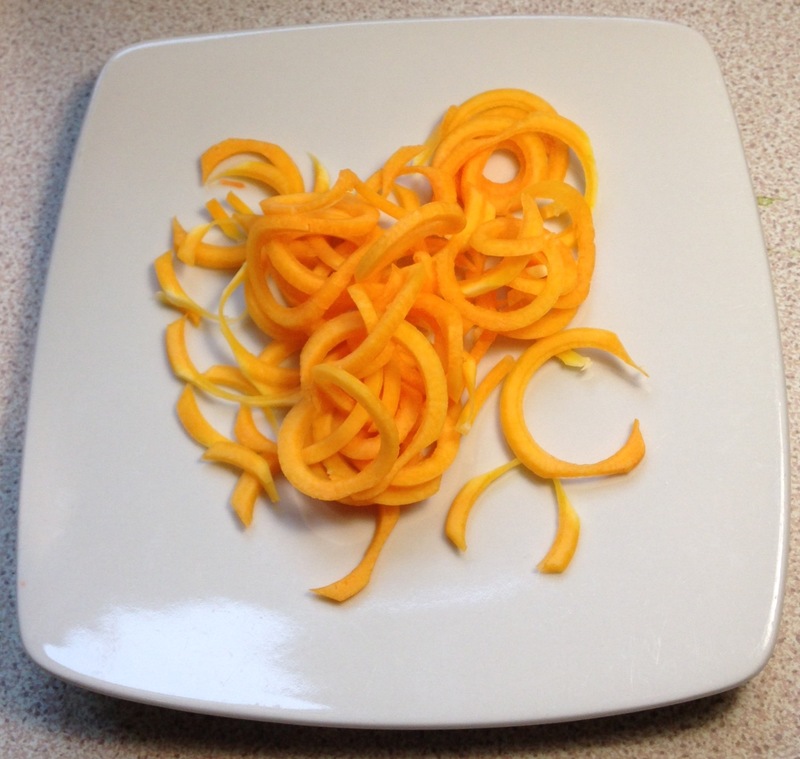 While the courgette went through easily enough, the resulting spirals were very small and quite watery so I changed to the coarser blade and this gave thicker and very long courgette spirals. You can see the difference in the photograph below. I patted the spirals dry with kitchen towel afterwards as they have a high water content and I didn’t want them to go soggy. Next, I tried carrot on the fine blade and again, it worked well although I didn’t get very long spirals. On reflection, this was due to the fact that my carrot was a bit too skinny and once on the spindle, didn’t reach all of the blade. Note to self: next time buy fatter carrots! You can see the result of using a carrot that was too thin in the photograph below although of course it’s still edible. After this, I used the butternut squash with the coarse blade and given that my pieces were not round, the resulting spirals were good. There were one or two shorter ones but on the whole, the butternut squash ‘spaghetti’ came out very well as you can see in then photograph. I had intended to try beetroot as well but I couldn’t find any in the supermarket but as in its raw state it is quite hard, I’m sure it would have spiralised well. I’m not sure if it would stain the gadget though so that’s something to be mindful about. Sweet potatoes would also be a suitable vegetable to spiralise. I’ve eaten a lot of vegetables during my weight loss journey with Slimming World and it’s always good to find new ways to serve them. 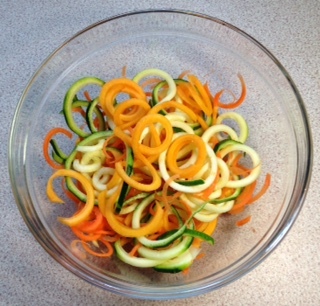 I really like raw veggies in salads and when they’re spiralised they look so pretty and are easier to eat and digest. 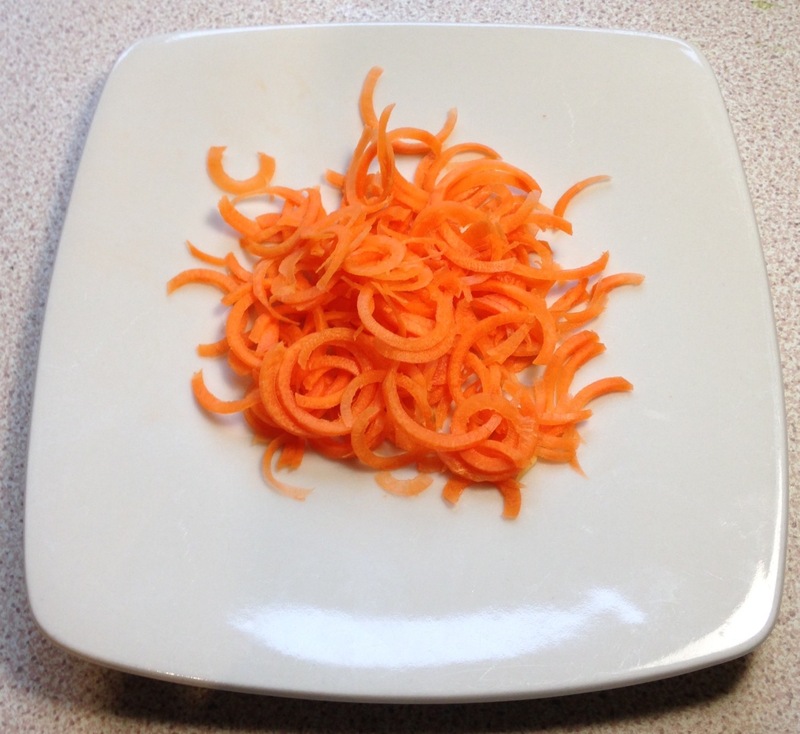 Here’s a photograph of my beautiful spiralised vegetables just before I put them in the fridge. We had spiralised raw vegetable salad with our dinner last night with a little lemon juice and a sprinkle of herbs and red jalapeno flakes. My husband added some olive oil to his portion and I have to say, the glistening veggies looked extremely appetising. They would have been equally as good lightly stir-fried with some garlic and perhaps a dash of soy and / or sweet chilli sauce. One of the latest food trends is to have spiralised vegetables instead of traditional pasta (giving a low carbohydrate option) and in this case, they just need a quick steam for about a minute. Any longer and they will turn to mush so don’t overcook them. Finally, I tried the grating blade with a chunk of hard cheddar. The cheese went through the grater like butter – very smoothly indeed. You really don’t have to apply a lot of pressure at all on the lid to get good results which makes it ideal for people who don’t have a lot of strength in their wrists or hands. I have previously used another brand’s hand-held spiraliser – one that is described as being operated with a ‘pencil-sharpening’ motion. That one didn’t have its own container and I actually found it quite hard work turning it so it’s currently languishing in the back of a drawer. I’ve also seen the somewhat clunky spiralisers that you have to assemble that then sit on a worktop, taking up a lot of space. While these might be quite useful for large households, they aren’t particularly attractive and they are quite cumbersome especially as you have to crank a handle to work them. These tend to be recommended by some of the high profile but not always nutritionally qualified ‘clean-eating’ brigade and are quite expensive compared to the Spiro. In my opinion, the Spiro would be an ideal addition to your kitchen if you have young children as it would certainly encourage them to eat more vegetables. For a two person household like mine, I found it quick and easy to spiralise a few vegetables for us and the clean-up was also fast. The Spiro can be put in a dishwasher although it’s easy to wash it in the sink. I love the fact that all the parts stack up together into a compact little unit which can be easily stored. The Spiro will not be languishing in the back of my cupboards, that’s for sure. 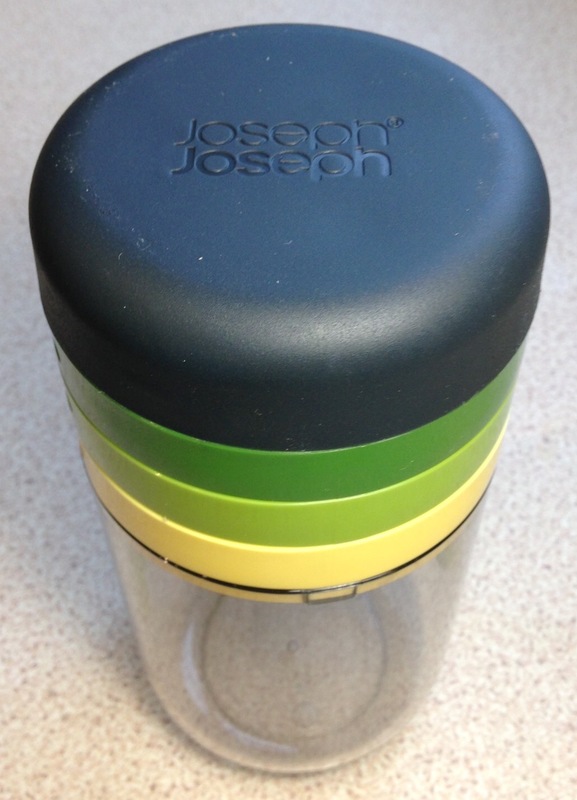 You can find the Spiro spiraliser in good cook shops and online at: www.josephjoseph.com. The retail price is £16. A note for Slimming World members (like me) – the Spiro will really encourage you to eat more speed vegetables so do think about buying one.